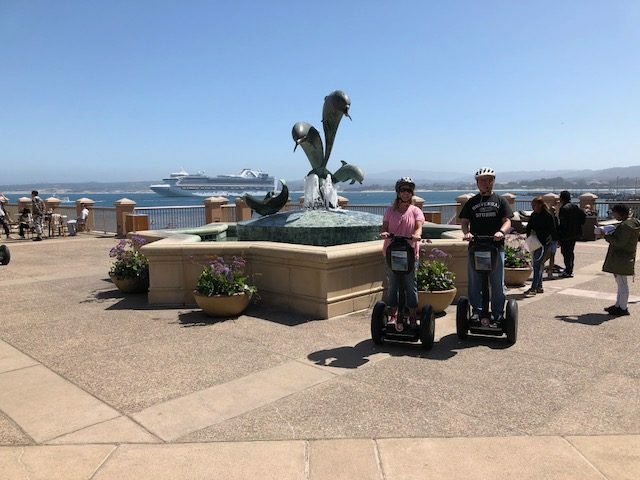 Your guide will demonstrate and teach you to ride your Segway PT before you begin your tour of Historical Monterey. You will view The Customhouse, the oldest governmental building in California, the state’s #1 designated Historical Landmark. The American flag was raised here on July 7, 1846, declaring California as part of the US. We will roll along the Recreation Trail which is a wide, scenic path that runs along the Monterey Bay. We will cruise by Fishermen’s Wharf and Cannery Row to see some of the buildings and areas that played a part in the history of Monterey. After passing by The Monterey Bay Aquarium we will roll along Wave Avenue and pass by the memorial to Ed “Doc” Ricketts, longtime friend of John Steinbeck and the person who was the inspiration for “Doc” in “Cannery Row”, “Sweet Thursday”, and other works. This Segway PT tour will take about 2.5 hours including the training time. Reservations are required. Same day reservations may be possible. Please call 831-324-4438 to set a reservation.